Geraldton Port is where the grain and talc trains terminate, it has seen quite a number of changes over the last ten years or so. More changes are proposed. This page shows the scene in 1993-4 when the mineral sands trains also ran into the Port. 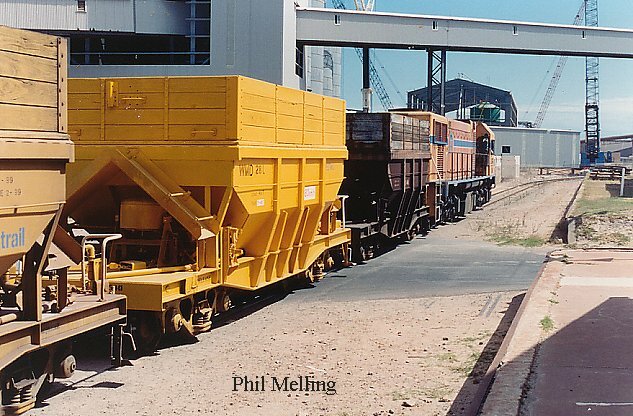 The Co-operative Bulk Handling (CBH) unloading area in 1993, today the unloading area is to the right of the new bins being constructed in this picture. 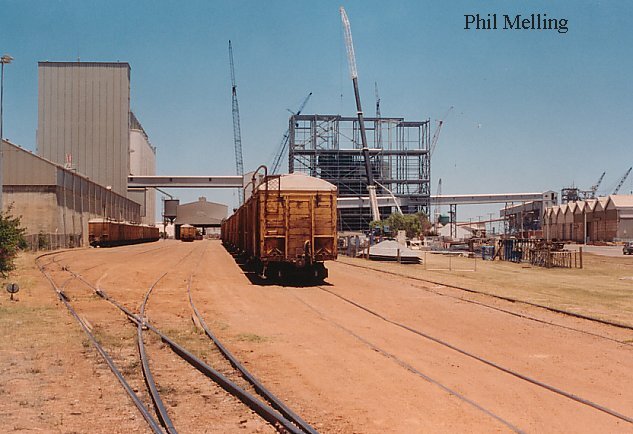 The old RCH type wagons also went when the new unloading facility opened as it is for bottom discharge, the RCH's had to be tipped on to a steep angle at one end rather like a truck (except the whole wagon was tipped). Photo taken on 11 December 1993. These lines have all been removed. 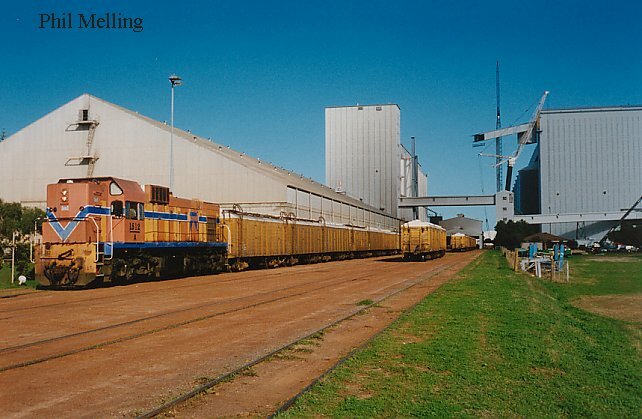 A1512 shunts grain wagons at the old grain unloading point at Geraldton Port on 2 July 1994. 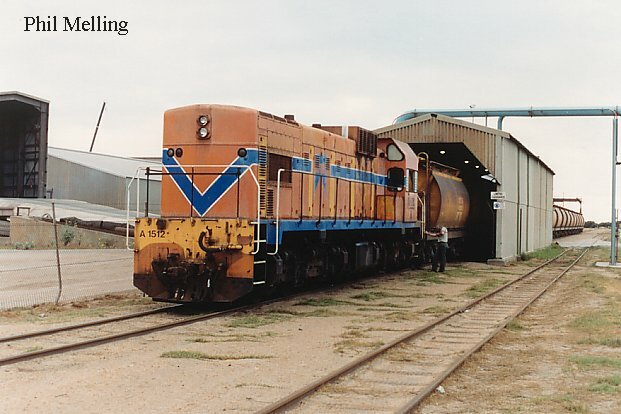 For more photos around the port see the Geraldton Port Railscene Page. 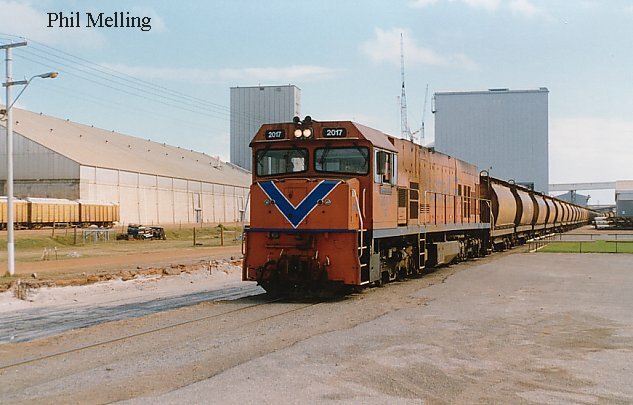 A1512 couples up to the Mineral Sands train after running round at Geraldton Port on 26 February 1994. Today there is a third running line behind the train and "the Sand's" only runs to Narngulu. The Narngulu to Geraldton portion of the trains operation often turned up different motive power such as the A Class thus allowing the usual P Class to be serviced. DA1576 leads the Talc train towards the Minerals unloading area (photo above). The shed being constructed in front and above is now the grain unloading area. There are now three rail tracks through this area. Photo Taken 29 March 1994. DA 1576 is now painted in the former Westrail yellow scheme and is still based at Narngulu and still can be seen on the talc albeit normally at night. P2017 eases the empty mineral sands train past the new trackworks at Geraldton Port. A few weeks later this track was decommissioned and replaced by two new tracks on the adjacent formation. Photo taken on 25 May 1994.